Many organizations in urban waters settings are working on similar initiatives to restore and protect water resources. An abundance of water quality data is collected and reported on independent websites, with data and information used to advocate for meaningful environmental changes. Sharing information and combining strengths of different organizations can create more complete and meaningful records, thereby enhancing the environmental impacts and magnifying community voices. 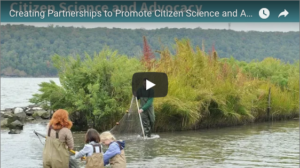 Learn how to create effective partnerships with other organizations in your area in this webinar, Creating Partnerships to Promote Citizen Science and Advocacy. In this session, the Lower Hudson Urban Waters Collaborative shares how they formed their partnership in the Lower Hudson River Valley to solidify a working relationship between four organizations – the Center for Urban River at Beczak (CURB), Riverkeeper, the Bronx River Alliance, and the Hudson River Watershed Alliance (HRWA). Join us to learn about how the partnership helped them coordinate multiple Citizen Science water quality monitoring programs, data collection protocols, and data storage methods for greater advocacy outcomes. Members of the team share how they are using data as an effective tool to inform local decision-making and amplify their community voice for environmentally sound policies. For more information on the Lower Hudson Urban Waters Collaborative, see a recent Urban Waters Learning Network Impact Story about their work. This webinar is hosted by the Urban Waters Learning Network in cooperation with members of the Lower Hudson Urban Waters Collaborative.